PT Pembangunan Perumahan (Persero) Tbk - PTPP or more popularly called PT PP (Persero) Tbk is a long standing state-owned public-listed general construction company in Indonesia which was formed in 1953. PTPP has more than 64 years of experience in developing prestigious buildings, infrastructure, property and EPC. PTPP is listed on the Indonesia Stock Exchange (IDX) under reference PTPP (listed since 2010). 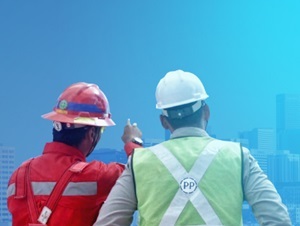 As a state-owed company, PTPP is majority owned by the Government of Indonesia and engaged in general construction industry. As today, PTPP is 51% owned by the Government of Indonesia, 0.10% by employees and employees cooperative and 48.9% by general shareholders. PTPP is based in Jakarta and its runs its head office is located at Plaza PP - Wisma Subiyanto, Jl TB Simatupang 57, Pasar Rebo Jakarta Timur 13760. PTPP now has 5 divisions; operation divisions I, operation division II, operation division III, operation division IV and EPC division. PTPP now has 9 domestic branch offices spread across Indonesia. In term of financial performance, achievement and performance of PTPP in 2016 shows positive results. PTPP managed to record a 20.41% growth in total new contract value of Rp32.6 trillion as compared with Rp27.07 trillion in 2015, according to PT PP (Persero) Tbk Annual Report 2016 as cited by JobsCDC.com. As of the end of December 2016, PTPP’s total operating income amounted to Rp1.97 trillion, up 23.41% from Rp1.60 trillion at the end of December 2015. Minimum Bachelor Degree of Civil Engineering from reputable university. Strong academic results with GPA ≥ 3.00. Have solid understanding about the principles of civil engineering, building qualifications, irrigation, ports, or roads. Good skill in using of IT application/program that related with civil/construction. Have experience in campus organization is a must. Willing to be placed throughout PT PP (Persero) Tbk projects (all over Indonesia and overseas). Minimum Bachelor Degree of Accounting and Business Management from reputable university. Have solid understanding about the principles of accounting and financial analysis. JobsCDC.com now available on android device. Download now on Google Play here. Please be aware of recruitment fraud. The entire stage of this selection process is free of charge. PT PP (Persero) Tbk - Management Trainee Program Batch 2 PTPP April 2018 will never ask for fees or upfront payments for any purposes during the recruitment process such as transportation and accommodation.